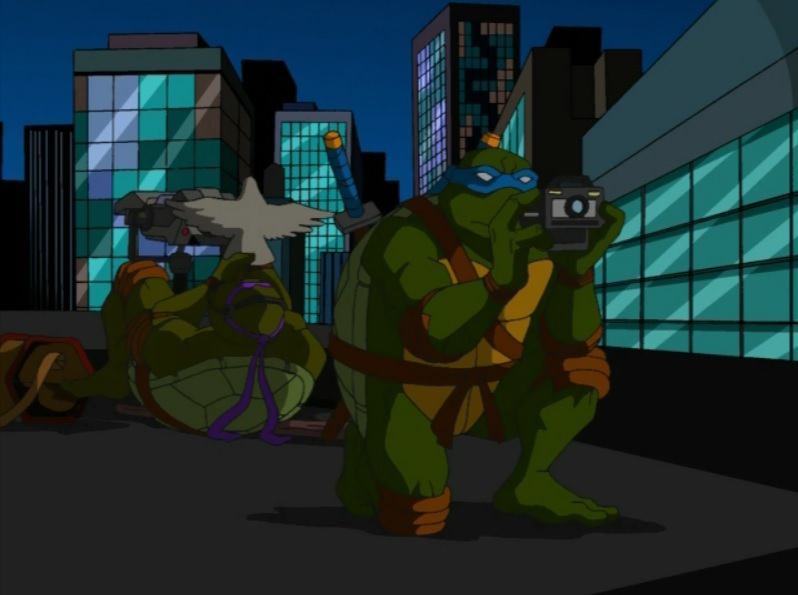 Teenage Mutant Ninja Turtles (2003) Season 1, Part 5 Review – AiPT! Hey, we’re at the end of the season! I should have divided these reviews up better; I just didn’t want to break up any of the multi-parters, but now I’ve got a 3-episode article. So to beef this one up, I’ll also be talking about the first series of Teenage Mutant Ninja Turtles shorts that were broadcast with the 4Kids cartoon on Fox. Next season, I’ll chop the episodes up evenly, multi-parters be damned. Season 1 feels like it should have ended last review. The Foot Clan is defeated (ha), the Shredder is dead (HA!) and the arc for Year One is pretty much done. But no, season 1 is hanging in there for three more episodes. With the Shredder out of the way, we can learn more about the Guardians, their strange trio of unison-talking masters, the alien technology fished from the East River and all that other stuff the show’s been so coy about. While searching for Splinter, Raphael saves a kid named Tyler from the Mob. Raph is blinded in the altercation and Tyler must act as his eyes so they can save the boy’s mother. So this is one of those “I never really liked it” sort of episodes. It introduces a tough, street smart little kid who befriends the Turtles and helps them beat a bunch of gangsters. It’s “Fallen Angel” all over again. Disregarding the similarities with the earlier episode from this season, “Lone Raph and Cub” just isn’t very interesting in and of itself. It’s meant to act as a breather between multi-parters, but they could have come up with something a little more exciting than Raph beating up worthless goons while getting heckled by a juvenile. What “Lone Raph and Cub” REALLY contributes, aside from the breather thing, is that it introduces “the Mob” (as they’re called) to the series. The unnamed Mob Boss makes veiled references to an approaching gang war, now that the Shredder is out of the picture, and all of this will eventually come to a head next season when the series takes a whack at adapting the “City at War” storyline. So this is a mild prelude to a season 2 story arc, but done in such an inauspicious way you could practically skip it without missing a beat. It’s hard to say much about “Lone Raph and Cub”. We’ve been there and done this. The situation is that Tyler’s mom is a reporter and has evidence that could incriminate the Mob Boss, so the Mob wants to kill her and her son before they can get to the cops. I wonder what was in that evidence? Maybe the Mob Boss’s name? Anyway, it’s sort of grim, but they use the appropriate Saturday Morning Cartoon euphemisms to satisfy Broadcast Standards & Practices (the Mob doesn’t want to “kill” Tyler, they want to “get rid of” him). The animation is really good in this episode, if I’m required to compliment it, and Raph’s alleyway battles with the Mob goons are all fast and fluid. The attention to detail and the high frame rate seem sort of wasted on a script like this, but it might be enough to get you through the episode. Unfortunately, the villains are all rather beneath the Turtles, especially after what they went through in the last three episodes, so even with Raph being blind there isn’t a whole lot of tension (exacerbated by the fact that none of the Mobsters are allowed to be shown with guns). The showdown is a boxing match between Raph and the Mob Boss, with Tyler yelling directions to Raph from the sidelines (“One o’clock! Four o’clock!” and so on). Raph’s movements rarely correspond to Tyler’s commands, so even with some nice animation the sequence fails to work visually. When the Guardians refuse to help the Turtles in their search for Splinter, they trail one back to his home base: The TCRI Building. TCRI was the company that created the ooze that mutated them and the Turtles have a feeling they’re behind Splinter’s disappearance. “The Search for Splinter” may advertise itself as a two-parter, but it’s really the beginning of a TEN-parter, as one multi-episode storyline leads directly into the next and no one gets a chance to slow down until a third of the way through season 2! So season 1 may be on its way out, but don’t think you’ll be getting any breaks in the narrative. This storyline adapts TMNT (Vol. 1) #4 and to stretch one issue out into two episodes, they add a lot of new content. The long and short of it is pretty faithful, however, and the new elements they include are all pretty great. Some of the smaller details that make the transition from comic to cartoon include the Turtles reaching the roof of TCRI via tightrope walking and, my favorite, obscuring a security camera by blocking it with a pigeon puppet. Every other ninja should be jealous over how well that works. So far as new elements added, there’s lots of room. The original TMNT #4 was a pretty cut and dry infiltration and escalation story: The Turtles find TCRI, break into TCRI, get into a fight, locate Splinter, and disappear into space (those last three plot points being saved for the second half of the cartoon adaptation). What the 4Kids writers add are subplots that give the other characters something to do. So the mysterious Guardian gets a few minutes of screentime and is the one who leads them to the TCRI Building. Casey acts as a distraction in the lobby (a really funny scene) so that April can sneak into the security room and help the Turtles break in. The new material feels organic, not just to the unique tapestry of the 4Kids storyline, but it might leave you feeling like something’s missing when you go back and read the original comic version. There isn’t a whole lot of action in this one, as it’s really all about getting the Turtles INSIDE the building. And by the cliffhanger ending, they STILL haven’t figured that out yet (episode ends with Donatello and Michelangelo falling off the ledge). Even with all the solid new subplots, you might be left feeling like the writers were stretching the plot out a bit. In other news, the Battle Shell gets rebuilt in this episode. I’m surprised Playmates fought the urge to replace it with a new van/truck vehicle; they’ll resort to that at least once or twice before the series is over. In fact, with only one episode left, season 1 is pretty much done shilling new action figures. I have to confess, season 1 is EXTREMELY toyetic, far beyond anything the Fred Wolf cartoon used to do. I suppose what works in the 4Kids cartoon’s favor is the WAY in which it introduced new toys. While some were pretty clumsy, they usually complemented the narrative and had an aesthetic that fit in with the cartoon; the action figures and vehicles seldom LOOKED like giant toys. While the Fred Wolf cartoon wasn’t quite so hell-bent on advertising product (at least beyond the third season), when it DID introduce a new vehicle or what-have-you, it tended to be in the most obscenely obvious manner (the retro catapult and flush-o-matic come to mind). I may be proven wrong in the coming months, but I don’ recall seasons 2-4 of the 4Kids TMNT cartoon spotlighting toys at quite the capacity as season 1. Yeah, there’ll be new action figures and vehicles and variants, but I don’t think it’ll be at the nearly one-per-episode rate that this first season was moving at. Again, it’s been a while; I could turn out to be wrong. We’ll see soon enough. The Turtles successfully infiltrate the TCRI Building only to find it staffed by weird brain-like aliens in robot bodies called Utroms. The Turtles won’t leave without Splinter, but the master of the building, Mortu, can’t let the Turtles leave at all. This episode gives us the rest of TMNT #4, introducing the Utroms to the series in all their squishy pink glory. Little brain-things with tentacles inhabiting the stomach cavities of robot bodies … Of course, you’re immediately thinking of Krang from the old Fred Wolf cartoon. The Utroms did serve as the inspiration for Krang, but outside of a few minutia references here and there (the newspaper comic), the Krang of the Fred Wolf cartoon was never explicitly linked to the Utroms until the recent Nickelodeon cartoon retconned his origins in a crossover episode. But now I’m getting ahead of myself. The Utroms are important characters to the mythology of the TMNT, playing humongous roles in the Mirage comics and being similarly valuable in the 4Kids cartoon. These Utroms are more benevolent than adversarial (contrary to their introduction in this two-parter), so they’re a bit of a departure from what folks only family with the 80’s cartoon and Krang were likely expecting. I think I’ve always liked them more as allies to the Turtles than enemies, such as in the Nickelodeon series (where the majority of Utroms seen there are a splinter faction called The Kraang with two “a”s). They open more doors for story potential as friends, whereas the bad guy root just treats them as typical beat-em-up fodder and doomsday device stuff. Most of this episode comes off a bit like padding, more so than the previous installment, as April and Casey exit the story early on and the rest consists of the Turtles trying to find their way around the building. It’s a bit creepy in places, with elevators that go nowhere, “illusion walls” ala DuckTales on NES, corridors that always take you back where you started, and so on. While it’s fun to watch them think their way through a maze for an act or so, it starts to get a little boring after a while. The Utroms reveal themselves at about the right time and we finally get to some real action. What’s clever is that even though the Utroms are the “villains” in this episode, we’ll find out later that they aren’t malevolent, so the writers keep that future revelation in mind when penning their portrayal here. They’re a bit inept and comedic, and aside from shooting lasers at the Turtles, they aren’t especially vicious. When their protagonist nature is revealed next season, you won’t be left with lingering questions along the lines of, “But then why were they acting like bad guys a few episodes ago?” Forward thinking was always this series’ strong suit. In the end, the Turtles find Splinter floating in a stasis pod, but before they can spring him, they stumble onto a strange platform that ignites and they vanish in a blast of energy. Next up is … A story arc I’ve never really liked in ANY incarnation. Mirage, 4Kids, Nickelodeon … Whenever they try their hand at the outer space storyline, I instinctively check out. I like sci-fi elements in my Ninja Turtles, but a lengthy string of stories where they visit alien worlds just wears me out every time. During the run of the 4Kids TMNT cartoon, there were three separate series of short cartoons: The Dong Woo series, the Flash series and the “Mayhem on Mutant Island” series. The Dong Woo series came first, and these were little segments that focused on character spotlights or vehicle promotions. I call them the “Dong Woo” series since they were animated by Dong Woo, the studio that animated every episode of the main series. Another studio animated the Flash series (which all look awful) and, while Dong Woo did animate the “Mayhem on Mutant Island” series, that was a unique scenario (basically, it was a complete episode chopped up into short segments then pasted back together later on). There are probably more, but I’m at the mercy of the internet on this; if it ain’t on YouTube, I can’t find it. Also, sorry about the quality of these screencaps. You see, the first series of Season 1 DVDs published by Funimation, the ones that had Leonardo and Raphael as murals on the spines, contained the shorts as bonus features. However, when Funimation reissued the first two seasons in complete season DVD sets, they omitted all previous bonus features. I “upgraded” without checking to see if I’d be losing anything, trading in my old DVDs for the new ones, and now I’m stuck relying on YouTube for the things. I still have the season 4 DVD set, though, and the ones contained there. But since we aren’t anywhere close to season 4 yet, I won’t talk much about those. Look at the jam I’m in! Anyway, these things are … neat? The animation on them, for the most part, is very good (the Shrednauts one being the only one with distracting animation errors I noticed), but outside of the joy of seeing a few seconds of “new” animation you won’t find in episodes of the show, they don’t offer a lot. Character insights are minimal and the vehicle-focused shorts are strictly toy commercials incognito. The season 4 set of shorts fair a little better than the season 1 set, focusing as much on gag scenarios as product placements. Stuff like the Monster Trapper Gear one are pretty blatant, but the one where the Turtles infiltrate Bishop’s base to steal ice cream sodas was clearly done just for laughs and not to get kids into toy stores. Like the Turtle Tips shorts from the Fred Wolf era, I’d consider these to be apocryphal at most. They present scenarios that clash with continuity, break the Fourth Wall, or even sometimes redo scenes from episodes but with minor differences. So again, they’re “neat,” but that’s about it. I would love a comprehensive DVD set that collects all the shorts, since they’re great as bonus features, but I wouldn’t hold my breath. Production studios pour money into these sorts of things (even 1 minute of new animation isn’t cheap to produce, kids), yet they treat them as purely disposable. Hasbro and Cartoon Network produced a slew of shorts for Transformers Animated, half of which were never broadcast or released on DVD (I think they were only shown once at a convention screening or something). These things are likely to be lost forever, so hold onto those old DVDs. I wish I had. Alright, so that wraps up season 1. I hadn’t seen this season in a long, long time and it was a blast to revisit it. I’d forgotten how much world-building it established with every episode, even on the minutest levels, and the narrative is very clearly planned out well in advance. Some episodes I remember disliking, I wound up enjoying, while other episodes I hated 13 years ago I still hate now. Good episodes have aged extraordinarily well and the animation holds up beyond my expectations. Overall, the 4Kids series really hit the ground running. Unfortunately, season 2 is my least favorite of what I consider the four good seasons of the series (seasons 1-4). It’s not bad, because it’s still a “good season,” but it is indeed my least favorite. While my enthusiasm to get to those episodes is a little neutered, I’m anxious to get beyond them to the REALLY good stuff, so I’ll try to power through.